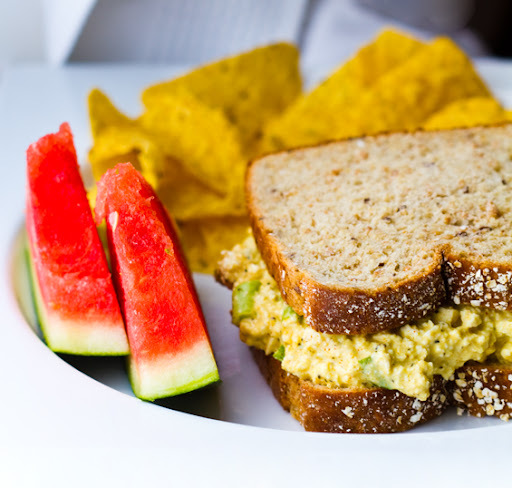 This vegan Tofu "Egg" Salad Sandwich really makes me happy. 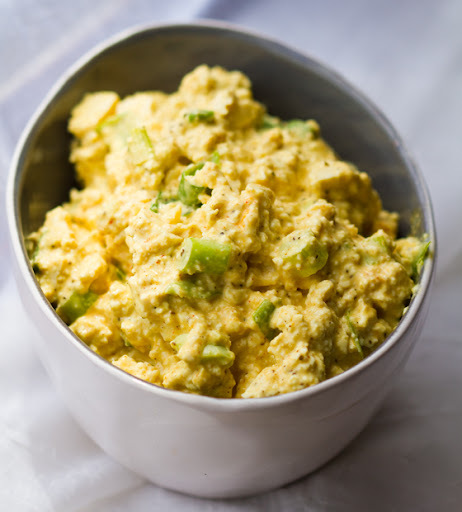 Spicy yellow Dijon, peppery scallions and a flurry of spices like celery seed and turmeric. This is one sassy, summer-y, salad sandwich. 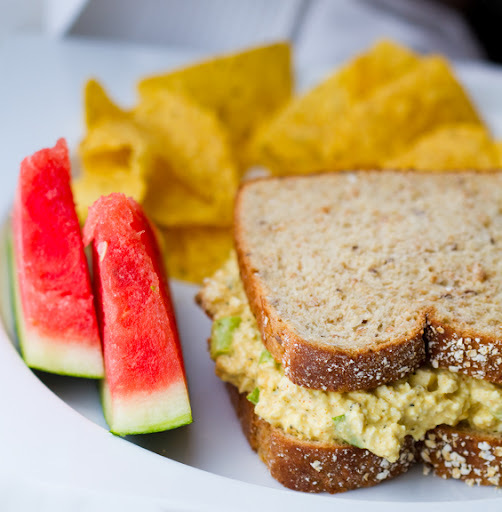 Easy vegan sandwich recipe, paired with a frosty, hydrating coconut water sip - done and done. Grab these recipes!.. UPDATE! Be sure to check out my updated Eggless Tofu Salad recipe here! And note - YES you can steam the tofu before using - see updated post link above for details. Pairing beverage? 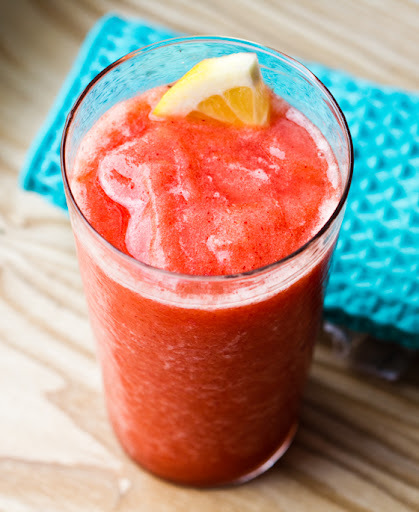 Coconut Water Frosty Recipe - peach and strawberry infused. Easy. High-Protein. Fun. This is an easy recipe to sell. It is incredibly easy to make - literally under 5 minutes and done. It is high protein from all that tofu. And I'll just throw in that it is fun because - well it is! 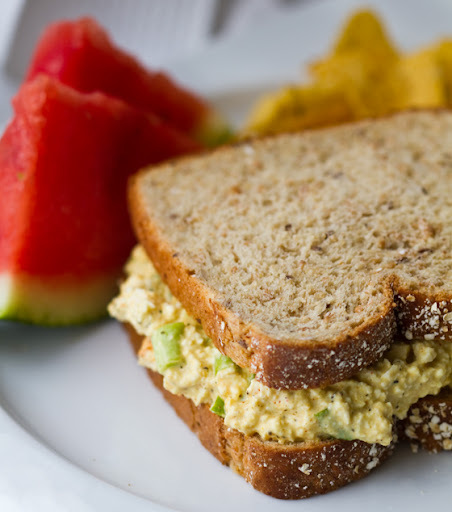 Bright yellow and easy for kids of all ages to dollop on top of some sandwich bread for an easy picnic lunch. Add a side of watermelon (of watermelon frosty - or coconut water frosty above) and some crunchy corn chips and your cheery, rustic, summer-y, all-American lunch is complete. 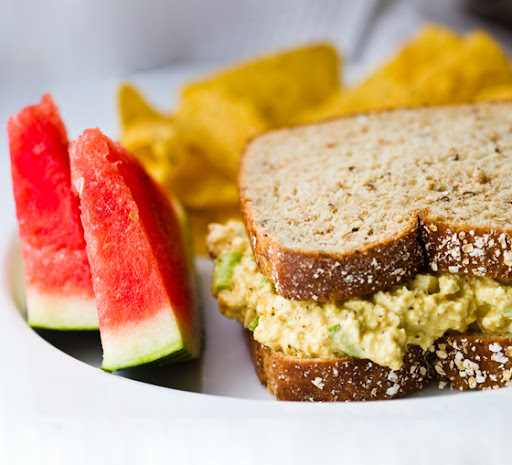 ..I could easily whip up a towering picnic basket-worthy pile of these tofu salad sandwiches in a flash .. while texting on my cell phone, feeding the cat and arranging my spice cabinet. OK, maybe not, but really this recipe is splendidly simple. 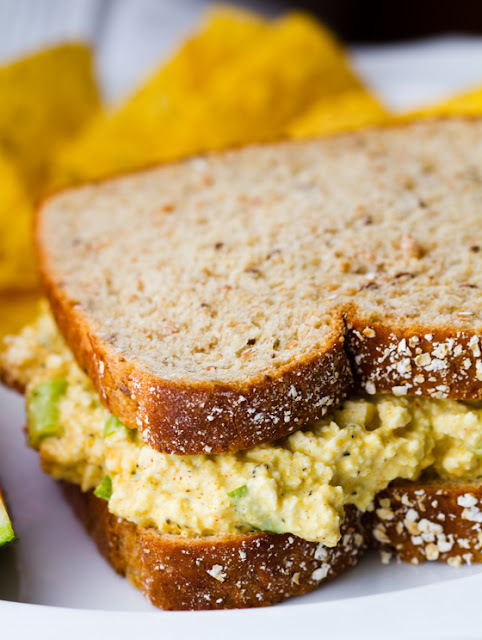 Grab some soft, fluffy multi-grain sandwich bread, a big block of firm tofu and whip this stuff up. Then this weekend, sun in the sky (we hope) .. just go..
Change it up. The best part about this recipe is that since the "tofu" part is so easy, you can get creative with the chopped veggies you fold in. Add scallions, celery, radish, onion, shallots, apple, carrot, bell pepper and more. Whatever lovely crunchy veggies you spot at your Farmer's Market this weekend will fold right into this salad mix. I tried radishes this morning and was in "Egg" salad heaven. OK, tofu salad heaven. Eggs, you're free to go, we don't need you for this recipe. Or any recipe for that matter! Versatile salad - you could also fill wraps or top salads with this yummy yellow stuff!.. 1. Prep veggies, dry and cube your tofu - toss in large bowl. 2. combine/whisk dressing and add to large bowl. 4. Chill until ready to serve!